| The Chinese have a saying; "Before setting off on revenge, you first dig two graves"! For Your Eyes Only is directed by John Glen and adapted to screenplay by Richard Maibaum and Michael G. Wilson from source stories by Ian Fleming. It stars Roger Moore, Carole Bouquet, Julian Glover, Topol, Michael Gothard and Jill Bennett. Music is scored by Bill Conti and cinematography by Alan Hume. Bond 12 and 007 is assigned to locate the whereabouts of the ATAC, a secret device that transmits orders to Polaris carrying submarines. He must do so quickly because the Soviets are also in pursuit, and they appear to be aided by a wealthy shipping magnate. In spite of the gargantuan box office garnered by Moonraker, Albert Broccoli was hurt by criticism that it had strayed too far from the basic 007 formula. Making good on his word to get Bond back to reality, he mostly succeeded in making For Your Eyes Only a stripped back thriller. Gone is the over reliance on hi-tech wizardry, Moore (in his best performance as Bond) is back to being down to earth, being a Bond using his wits and toughness to get out of tricky situations, and the film goes for short sharp shock action scenes instead of giant battles enveloped by even bigger sets. There's much tension as well, none more so than with the finale, where again the big bang pyrotechnics have been replaced by a mountain peak accent and assault; where Bond uses a boot lace to save his skin! Now that's the Bond we love and admire. We even get the return of a bit of flirting between Moneypenny (Lois Maxwell) and Bond, while Q (Desmond Llewelyn) is on witty form. Characters are strong, a major plus point in the film. Topol (charismatic and on scene stealing form) and Glover offer up fascinating characters, with Glover excellent as Kristatos, providing the franchise with a cultured and believable villain. Melina Havelock (Bouquet convincing) is tough and driven by revenge for her murdered parents, adept with a crossbow she makes a sturdy accomplice for Bond, and thankfully their union isn't bogged down mid mission by the "between the sheets" angle. Elsewhere, 007 editor John Glenn directs the first of his 5 Bond movies, impressive first outing with the underwater scenes particularly striking. Hume brings Corfu to life via his colour lenses and Conti oversees one of the series' best title theme songs, song with deep emotional beauty by Sheena Easton. His overall score is merely adequate, with decent nationalistic flavours, but the theme song is so strong it lingers to this day in the memory of all Bond fans. The exploding Lotus at the start of this movie was a tacit acknowledgment that Bond would not be relying on fancy gadgets in this movie as he had done in the last few entries in the franchise. Vicar: Mr. Bond, Mr. Bond. I'm so glad I caught you. Your office called. They're sending a helicopter to pick you up. Some sort of emergency. James Bond: It usually is. Thank you. 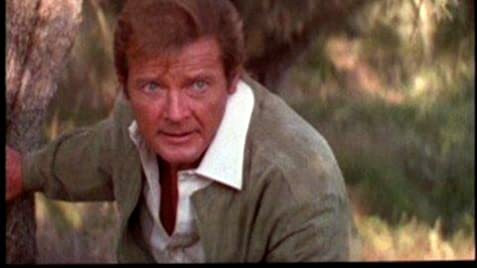 When Bond reaches the top of the cliff and the man "kicks" Bond in the face, it doesn't even come close to making contact, yet, Bond reacts as if it connected. Video prints prior to the early 1990's had the opening and closing titles formatted to fit the screen. Current video prints have the opening and closing titles letterboxed.